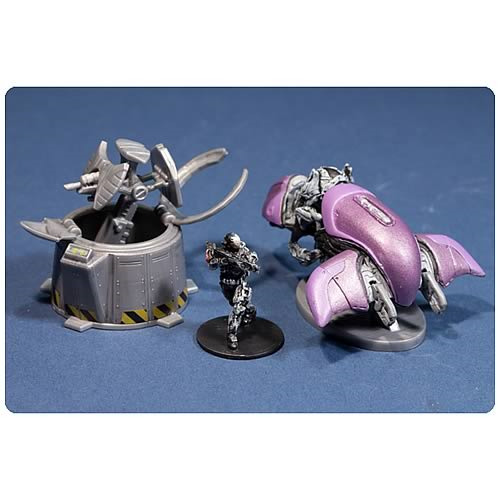 The Halo Micro Ops Series 1 Ghost vs. Wolf Spider Turret Mini Vehicles pack includes a Spartan figure and a Grunt figure for 4 total pieces. Ghost (Type-32 Rapid Assault Vehicle), is a Covenant's (enemy) standard reconnaissance and rapid attack vehicle. The pack also includes a Wolf Spider Turret (M8 Automated Defense System), which is an automated defense turret utilized by the UNSC during Halo: Reach. McFarlane Toys expands its long-running, best-selling line of Halo collectibles with the addition of Halo Micro Ops! The Micro Ops Series consists of ultra-detailed miniature figures, vehicles, and locations from the entire Halo universe, at roughly 15-millimeter scale (1:100). Halo Micro Ops covers the Halo universe from the tiniest Grunt figure to the largest Scarab vehicle, with all the pieces perfectly in scale with one another. And Halo Micro Ops delivers the whole package with all of the amazing detail and game accuracy that McFarlane Toys is famous for. Collectors can recreate their favorite Halo moments from campaign, multiplayer, or firefight…Or just create their own custom scene! When you turn the scale down, you turn the possibilities up! Ages 8 and up.